It is hard to think of a tune as pervasive in our culture as Louie Louie. The ultimate garage-band and frat-party song of all time, it is the epitome of attitude and the precursor of both rudimentary metal and punk. Though Louie Louie has been covered in over 200 different renditions, the definitive version belongs to The Kingsmen, who released it back in 1963 and gave it its familiar “da-da-da, da-da, da-da-da, da-da” rhythm pattern. One of rock’s happy accidents, it came about when lead singer Jack Ely incorrectly taught the Wailers’ version to the band at an early recording session. In true garage-band fash­ion and in keeping with the twisted evolution of rock music, the song was recorded practi­cally ad lib in a primitive local studio for $50, using only three mikes. It rose to become one of the permanent icons of rock ‘n’ roll. 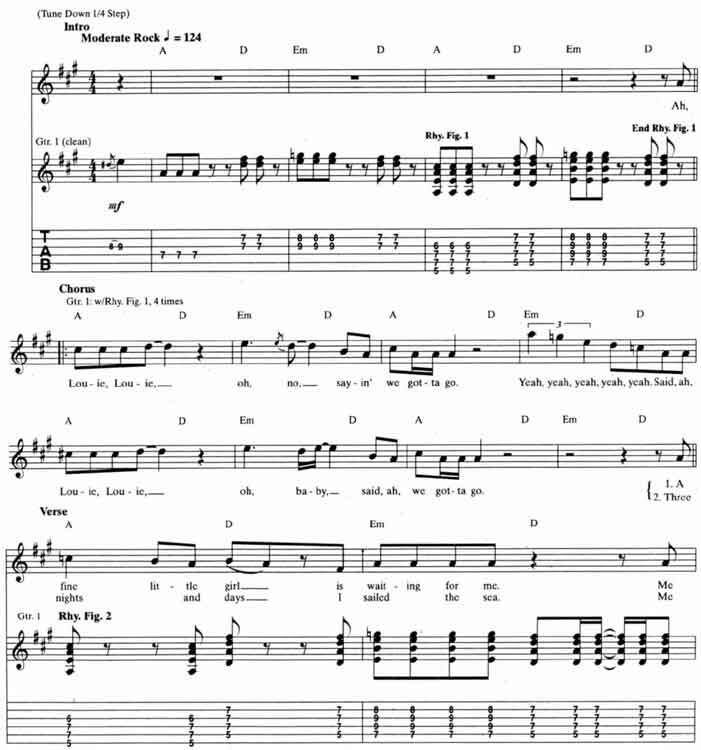 Epilogue to Louie Louie: Richard Berry, who composed the tune, died in 1997. Tune down a quarter step. Probably the result of varied tape speed or tuning to an out-of-tune reference instrument. The chord riff that defines Louie Louie is a perfect example of a one-four-five chord progression with a slight but unexpected twist. The entire song is based on A, D, and Em chords [Fig. 1] repeating in an A—D—Em—D (I—IV—v—IV) pattern. The twist appears in the form of the minor sound (notated as “v” instead of “V”) used for the V chord of the changes. Notice that the I chord (A) and the v chord (Em) share the same physical shape and that the whole riff exemplifies the parallel motion of rock music to come. Truly a main riff, these three chord voicings are employed for the chorus as Rhy. Fig. 1 and then with a rhythmic variation for the verse as Rhy. Fig. 2. The parallel-barre-chord ap­proach foreshadows rhythm figures like the Kinks’ “You Really Got Me” and “All Day and All of the Night,” while the grunginess and atti­tude embody the essence of unproduced rock ‘n’ roll. The guitar solo presents a beautiful exam­ple of early-60s rock soloing – what rock gui­tar improvisation sounded like before the Beatles, Clapton, and Hendrix came along. Borrowing blues, surf, and rock ‘n’ roll ele­ments, it is virtually anchored in the 5th posi­tion blue box [Fig. 2] and uses simple, recur­ring melodic patterns on the top four strings for the bulk of the lines. Note the use of Chuck Berry – inspired double-stops in the phrases and the absence of string bending beyond quarter-step and half-step bends – in those days, extra light strings were an anom­aly. Notice also the move to the 1st position in measures 7 – 8 and 13-16, which provides a sort of closure to the larger sections of the solo. It’s a part of The Kingsmen Louie Louie guitar lesson. © 2012 - 2019 TabsClub Powered by TabsClub 42 queries in 0.269 seconds.